The Kel-Tec RDB rifle series is one of the most exciting innovations to the bullpup rifle concept, since well, the bullpup rifle concept. This true ambidextrous rifle features downward ejecting brass, and can be quickly configured for left handed shooters by simply changing the location of the charging handle. It is lightweight, compact, and even available in two unique configurations (the model C and S) which are legal in states which ban modern sporting rifles by arbitrary aesthetic features. (I’m looking at you California, New York, and others.) Regardless of the configuration you favor, be it the traditional RDB-17, or the wild looking RDB-C (I’m saving my pennies for one, and I don’t even live in a ban state), you’ll find they are a unique, and highly successful bullpup design. George Kellgren, founder of Kel-Tec is famous for his innovative designs, and love of squeezing accuracy and performance out of lightweight and easy to manufacture designs. 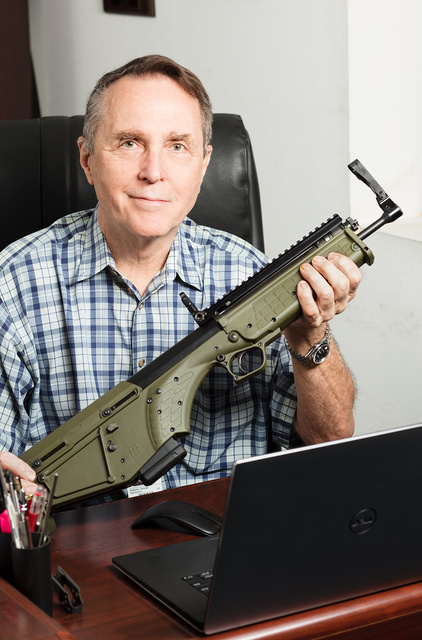 His love of compactness and polymer show up throughout the Kel-Tec product line, and so it was only natural that this Swedish born inventor would turn his genius to the bullpup rifle concept. The bullpup rifle concept puts the action of a rifle behind the trigger, which makes it more compact without sacrificing barrel length. This concept dates back to the early 20th century, but did not start becoming popular until around the close of World War Two, and with the 1977 adoption of the Stery AUG, it became a military and eventually commercially successfully concept. The primary drawback to the bullpup design (the origin of the term bullpup is somewhat shrouded in mystery, pick a story you like best, and run with it) is poorer balance due to to the mass of the action and magazine placed at the back of the rifle. However, that problem can be overcome with careful ergonomic engineering, which is where the Kel-Tec RDB series comes into play. The RDB (Rifle, Downward-ejecting, Bullpup) is advertised by Kel-Tec as “the bullpup done right”, and there is a lot to support that bold claim. Chambered in .223/5.56 (although some effort has gone into developing a 6.5 Grendel version), the RDB is available either in a more traditional pistol grip configuration, or a strangely appealing C (California) version which does away with the irrationally restricted pistol grip, and muzzle brake, and puts it in a polymer stock that is both very different than anything made, but echoes traditional looking firearms. But we’ll get to the C (and it’s related S configuration) in a minute. The standard RDB comes with a 17” barrel, standard birdcage flash hider, a special ergonomic stock with removable rubber buttpad (likely for modifying length of pull, as this fine rifle has almost no recoil), a built in pistol grip, and fully ambidextrous safety and mag release. The charging handle can be quickly fitted to left or right handed shooters in just a couple minutes without tools, and the clever downward ejecting brass system improves reliability. Fitted with top and bottom Picatinny rails, the RDB is ready for the optic or sights of your choice, and can be readily fitted with a foregrip, a tactical light, or laser. I think the lack of side rails, or ability to install rail sections on the sides of the gun is something of a shortcoming, but on the other hand, I can’t think of the last time I actually mounted something on the sides of my rifle, so maybe it isn’t that big of a deal. Naturally, the RDB takes standard AR-15 style magazines of all types, and ships with a neatly compact 20 round Magpul poly mag. Various drums and 50-100 round magazines have all be successfully used in the RDB, along with 10 round benchrest mags. Kel-Tec heavily promotes the “silencer ready” construction of the RDB, which is more than just a threaded barrel. Rather, the RDB ships with a built in gas adjustment system. Now many semi auto rifles have a fixed gas system, which means they tend to be overgassed to function with most any ammo, or with a suppressor. However, smart shooters know that an adjustable gas system is far superior, and allows the rifle to be tuned to a particular load (or even for the difference in performance temperature swings can cause). This gives the RDB a real edge over most AR-15 style rifles- even those fitted with adjustable gas blocks, as the RDB can be quickly adjusted by hand, or with the tip of a bullet. Lastly, the bottom ejection of brass is what makes the RDB a real game changer and allows it to be truly ambidextrous. While it’s easy to make mag releases and safeties work for left and right handed shooters, guns built for left handed people usually require tooling up a whole new gun to achieve left side eject. The RDB does away with that problem by dumping the brass out at your feet, instead of flinging it about, or forcing left handed shooters to accept awkward ejection. Kel-Tec wasn’t kidding when they called it the future of bullpups. As American gun owners know, not all states embrace the notion of “gun rights” and “civil liberties” with the same fervor. For instance, California has some of the most restrictive gun laws in the nation, and like to pretend if a gun doesn’t have certain largely cosmetic or ergonomic features, it is magically safer and not likely to be used in crime. Or whatever mindless mythology they are promoting that week. The point is, that evil, scary “instruments of war” like the AR-15 are effectively banned there without absurd workarounds, but less scary looking firearms using similar technology are perfectly fine. Because we all know if a gun doesn’t have a pistol grip, or an adjustable buttstock, it can only be used to shoot at tin cans and paper targets, and not for illegal activities. Isn’t gun control great? Sarcasm aside, California, New York, and other less legally and socially advanced states are also major population centers, with many law abiding gun owners living there. That makes building a rifle that gives these unfortunate gun owners a chance at enjoying a nice modern sporting rifle an economically appealing proposition. Enter the RDB-C. This marvelous rifle not only does away with the horrifyingly scary features like a pistol grip that the RDB has (yes, more sarcasm here folks, the only thing scary about the RDB is the fact my local gunshops didn’t have one in stock and needed seven days to get one from a distributor), but in doing so created an ergonomic, aesthetically pleasing rifle that should be appealing even to folks living in more civilized US states. This stock closely resembles traditional rifle stocks, while still using the same proven action of the standard RDB, and fitting the magwell in the wrist of the stock. The RDB-C ships with a ten round magazine suitable for states that are also afraid of numbers greater than 10, and lacks a flash hider (because those are terrifying too). However, it retains the threaded barrel, and you can add whatever muzzle device or suppressor you can legally get away with. I really, really like this rifle. Mostly because it is an amazing combination of advanced bullpup technology stuck in a classic looking stock. It is the same reason I enjoy the SKS, only the RDB-C is 21st century tech, not fancified WWII tech. If you live in a place like California, this is really your only choice. If you like a classy looking rifle and live in a state without gun bans, it is still a fine rifle. off the new RDB-S rifle. George Kelgren is no idiot. Having created the RDB-C, he found a way to make it better, and useful to more people (as if the C model wasn’t already useful). The RDB-S for Survival, builds on the basic RDB-C, and adds an adjustable stock that adds a couple more inches to the length of pull, a fold-down front and rear sight, and a 16” barrel (as opposed to the C’s 20”), and a special flush fitting magazine to preserve the sleek profile. 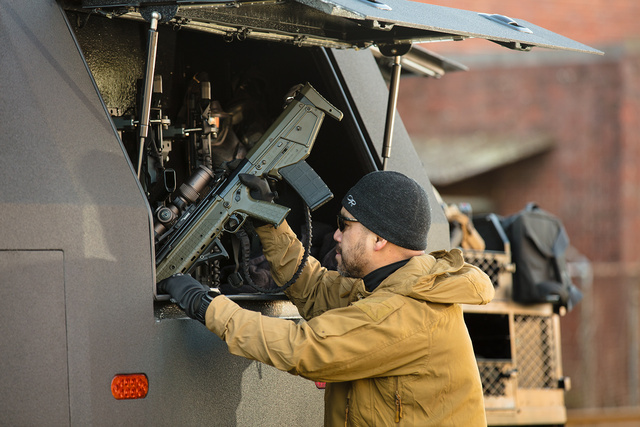 Add an easier to use mag release, while retaining all the ambidextrous features of the RDB series, and you’ve got a real slick truck gun here. Really, the RDB-S is a slick gun for a lot of tasks. There are real markets for survival rifles, particularly for stowage in aircraft, persons traveling to or working in remote areas, as basic truck guns, or really any place you might imagine wanting a rifle, but needing one that is compact, light and easy handling. One might imagine one stowed under the seat of an Alaskan bush plane, or carried by a backpacker into the wilderness, or kept behind the seat of a truck when driving the long distances between populated areas that are common in the American west. Naturally, all the features that make it a great survival rifle, also make it a great all purpose rifle. While it can’t mount a silencer or muzzle device, it is otherwise internally a standard RDB, and fitted with a slightly modified C model stock, which means if size and ease of handling matter, this might be the RDB for you. However, it won’t be yours for a while, as this model has just entered production at the time of this writing, and won’t be available in large numbers for a few more months. There are several reasons really. Some folks are really into the bullpup concept, and arguably, in some states, the RDB-C is a superior option to any of the neutered AR-15 options out there. If you are a left handed shooter, there may be no better semi-auto rifle for your shooting needs, and if you are fan of lightweight, handy, innovative guns, well the RDB series fills that bill too. Let’s run down the key features again. Suppressor ready (RDB and RDB-C models). 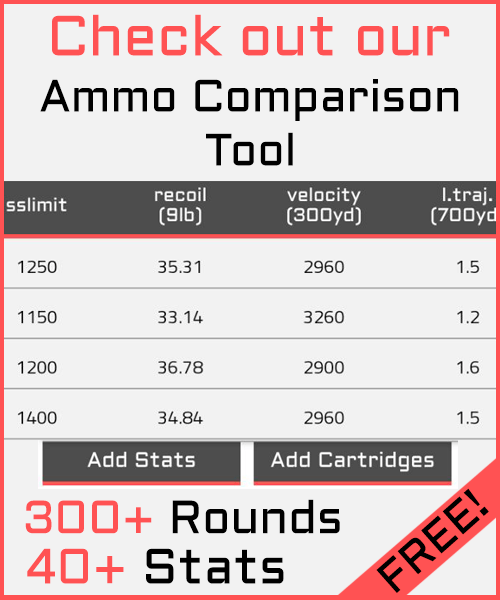 Accepts standard AR-15 magazines, and large capacity drums/specialty magazines. The RDB family is a three rifle collection that is suitable for police/tactical use, home defense, hunting, target shooting, ranch rifle, truck gun, survival, or just as an all purpose carbine. Really, I’d go so far as to say the RDB is the 21st century equivalent of a higher end lever action rifle. While there are cheaper carbines out there, the level of quality, performance and design in the RDB rifles cannot be readily matched at this price point, nor in an all American made bullpup. Put simply, the RDB is a best in class rifle that packs premium features into a blue collar price tag. What is the Best RDB for me? Well if you live in a state with bans on so-called assault rifles, then the choice pretty much has been made for you, as the RDB-C is your only real choice. Carefully designed to not run afoul of oppressive laws based on arbitrary concepts that have no real ability to prevent criminal misuse, the RDB-C is a triumph of capitalist engineering, and is really a nice rifle, rather than a cobbled together collection of half baked ideas to work around “assault weapon” bans. As I mentioned before, the RDB-C is strangely appealing to me, even though I’m not in a ban state. Buyers of the RDB should take a close look at it, and see if the traditional lines make it more appealing or comfortable to shoot. Everybody is different, and the C configuration may be more comfortable for you, or it may seem less “threatening” to persons inexperienced with firearms, which makes it easier to introduce them to the world of shooting and gun rights. The RDB-S pretty much defines the primary role it was built for. This is a survival rifle. Buy it for stowage in an airplane or other vehicle, where you need a light carbine when outdoors, or to stash in your home or cabin for when an emergency occurs. The light weight, sleek profile, and compact size make it a winner, even over the AR-15. Otherwise, the standard RDB is what you need. Particularly if you want a bottom Picatinny rail, and a more standard bullpup configuration. As you can see, the Kel-Tec RDB is a marvelous rifle, built to exacting tolerances with only the highest quality materials. It brings real innovation to a type of firearm that has never quite made the big leagues, but continues to hold the interest of military and private citizens alike. It rather neatly brings a truly ambidextrous rifle to market, which when combined with the use of common ammo and magazines, makes it highly appealing to left handed shooters, and Kel-Tec has not forgotten Americans in restrictive states, and has managed to bring the RDB technology to everybody with the C and S models. No matter how you slice it there is an RDB for your needs and local laws. What are you waiting for?